Kevin Ellison and Paul Mullin have given Jim Bentley plenty to think about. Morecambe boss Jim Bentley is pleased with his attacking options ahead of Dagenham & Redbridge visiting the Globe Arena on Sunday. Kevin Ellison and Paul Mullin replaced recent starters Padraig Amond and Jack Redshaw in the win over Mansfield on Tuesday night and scored meaning The Shrimps boss has something of a selection headache this weekend. Bentley said: “I’d rather have that than have no-one fit like we’ve had in the past. “Padraig Amond and Jack Redshaw have been the starters recently. “Podge has got four in the last nine or 10 games and Jack has three in seven games. “But we just thought the other day we needed to change something. “We hadn’t won, we knew what Mansfield were going to offer and we just thought Mullin and Ellison might have been that partnership to go with. “It worked well against Bury, it worked well against Luton and I’ve got a headache now because they both scored. The Daggers are old friends with the sides having met more than 30 times over the years in the Conference and League 2. Wayne Burnett’s may be 18th in League 2 but are unbeaten in their last four ahead of their trip to the resort. Bentley said: “They’ve picked up and I think they’ve only lost one in eight. “Defensively they’ve been good and at the other end they’ve got Jamie Cureton who’s still scoring goals at 39 and is in to double figures already. “All over the park they’ve got good players. “They’re a good footballing side, have got pace in the team and will be looking to extend their own little unbeaten run. 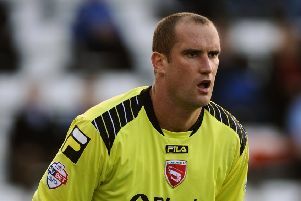 Bentley believes the win over Mansfield on Tuesday night, The Shrimps’ first of 2015, is big not just because it moved his side to within five points of the play-offs but also because of the release it will give a side who have come close to three points on a number of occasions since the turn of the year. He said: “It’s surprising what a win does for you. “It’s important psychologically and a big win for the fans as well. “People will say you shouldn’t be playing with any fear but the league’s that tight you can easily get sucked in.